Tosafist of the early part of the twelfth century; a pupil of Rashi; probably the father-in-law of Samuel b. Meïr. He appears as a tosafist in Ber. 13a, 25b; Pes. 114a; Ket. 61a; Ḳid. 26b, and is mentioned as a casuist by Judah Sir Leon on Ber. 11b. In "Haggahot Maimoniyyot," to "Tefillah" (ch. vii. 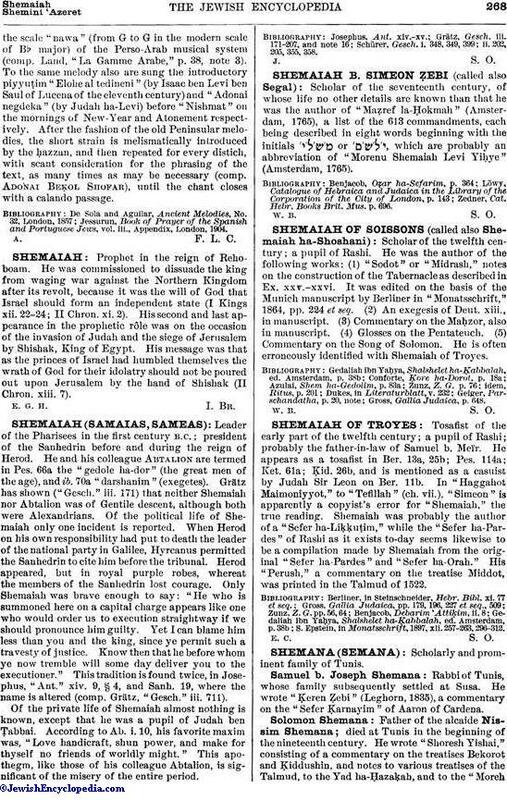 ), "Simeon" is apparently a copyist's error for "Shemaiah," the true reading. Shemaiah was probably the author of a "Sefer ha-Liḳḳuṭtim," while the "Sefer ha-Pardes" of Rashi as it exists to-day seems likewise to be a compilation made by Shemaiah from the original "Sefer ha-Pardes" and "Sefer ha-Orah." His "Perush," a commentary on the treatise Middot, was printed in the Talmud of 1522. S. Epstein, in Monatsschrift, 1897, xli. 257-263, 296-312.